pomegranate is doing something very important. quite simply, they are illuminating, with appropriately jewel-like books, the era of printmaking, in this country and in japan, of the last century. we have al- ready looked at pomegranate's new books of shin hanga; this time we look at their new, beautiful, book about william seltzer rice. 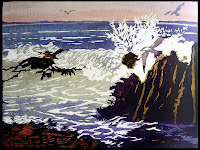 rice was the quintessential california printmaker; every one of his prints rings true in the hearts of we californians who live and breathe life here -- rice lives in that place of the heart. 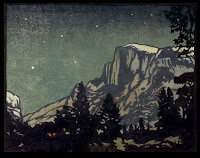 while he would go on to publish books about block-printing himself, in the beginning the teachings and books of arthur wesley dow had a major influence on him. his own initial contact with japanese prints came at the panama-pacific international exposition in san francisco in 1915. after having spent so much time as a painter, he saw and admired, in the prints, the simplicity, the vivid colors, and the clarity of form through outlines. he had seen these prints in books, but seeing them in person was transformative. though he worked with lino-cutting rather than the full, complex, japanese methods of making the prints, it's clear that the lessons were well learned. the new book, william s rice: california block prints, includes a helpful essay, giving glimpses of artist as man rather than simply technician. while william rice was friends and colleagues with many of the other american printmakers of his time, his vision was his own. translating his obvious love of nature into color and line gives us a legacy of a california past that we will preserve as long as we can. and this series of pomegranate books will help that along. there used to be a sign in a long-gone bookstore near here that read, "books will get you through times of no money better than money will get you through times of no books." Just wondering how you come up with all these incredible images. They are breath-taking. Thank you! thanks to you too, jana! and thanks to pomegranate for continuing to make sure that this stuff is out there. Thanks for the interesting post. 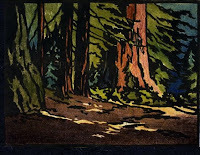 I am particularly intertested to find out much more about the Californian Arts & Crafts scene in the late nineteenth and early twentieth century and this post has inspired me to find out more. But then, your site is always a great inspiration. Thanks! you are very kind, john. thannk you. i was fortunate enough to attend an exhibition on that subject some years ago at the (local) oakland museum. check out trapp's book on the subject. can';t wait to see what you come up with! the best, and best known, photographer on the subject. Thanks for the info and links. I will be sure to check them out.